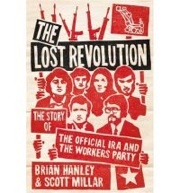 In the first week of its release, ‘The Lost Revolution’ shot straight into the top 5 non-fiction titles in Ireland. This in itself showed the enduring interest in the Official Republicans/The Workers’ Party. This interest was brought home to me again at the launch of the book, held in the Teachers club on September 12, which attracted an audience of around 300, including current and past members of the Official movement, as well as dozens of interested individuals from across the broad range of Republican and left groups in Ireland. This interview enquires about the interest in their subject by the authors, Brian Hanley and Scott Millar. It also includes some analysis from the authors on key events covered in the book. Red Wedge: Why is this the first book to be written about the Official Movement? Brian Hanley: I suppose it suited a whole range of otherwise antagonistic people. One of the ironies is that the version of history that says the Officials wanted to demilitarise and become completely passive ties in with what the Provisionals say about them. Some people wanted to leave it all behind them, and then you have some people who have done very well in Irish society and would rather there was just the bland version of the party they were in rather than a warts and all story. That’s one of the reasons why it was never before been written as a whole story. Scott Millar: I think there was a change in the Workers Party approach in things from early in this decade. When I approached a long term colleague of Sean Garland, it came back that he was intrigued that we were going to do this project. I think it was partly that Sean Garland was getting to a certain age and felt there was a danger he would be written out of history. There was a history developing where these guys were just minor players, where guys like Garland and were just backroom players rather than the real makers of the Workers Party. I think they wanted to set the record straight. When I went to Garland originally, and even when we got in touch with people like Mick Ryan, it was made clear that this was going to be the history of the whole thing. I think you have to be certain age to look at the whole thing. This was prior to Garland’s recent legal difficulties. Maybe, if you look at that conspiratorially, it’s another attempt to keep Garland quiet about things while he is still under some sort of legal threat. RW: If there was a willingness from key figures to engage with this project, was there a willingness from figures that had left the movement to occupy the influential positions in Irish society that Brian mentioned? BH: Aside from the Workers Party, there is another organisation called the Official Republican movement, which again is largely veterans the 1960s, 70s and 80s. And again, they were a constituency that felt they had a story which had been completely ignored. Any books that have come out on the history of the IRA and the history of the troubles treat them as a footnote or don’t talk about them at all, and again you have people like Billy McMillen and Malachy MacGurran who were major figures in Republicanism in the 1960s who people just don’t hear about. Instead you hear a story of a tiny Republican movement that suddenly mushroomed after 1969. I think we try and bring out in the book that there was a lot going on before hand. So they were extremely interested in someone writing the story but would never have done it themselves. Nobody was going to emerge from the Workers Party or the Official Republican movement to do it. It took someone coming from the outside. SM: Not only were they getting ignored, there were lies getting told about them. If you look at Eammon Malley’s Provisional IRA book, there is talk of unidentified gun men. unknown gunmen doing this and that. It took two people like me and Brian, who although interested in the left, are not intricately involved, to do this. A history like this couldn’t be written by someone within the movement. It would have been breaking codes of comradeship that would have cut very badly. BH: And it would have been very difficult for people inside the movement to look critically at incidents that a lot of the people involved have glossed over and haven’t wanted to deal with in any sense. They might not want us talking about these things, but it’s us talking about them. RW: The early stages of the book describe the moves by the Republican movement after the failure of what become known as the border campaign. Are there similarities here between the role of Cathal Goulding and Gerry Adams decades later, in that Goulding argued that Republican goals would not be realised by violence? SM: There are direct parallels. One of them is when Goulding wants to get some things that were hitherto unacceptable through the army council; he increased the membership to 20. My understanding from reading the Provisional history is that Adams does exactly the same thing. He creates what Ed Moloney calls ‘the revolutionary council’, which has a massively weighted majority in favour of the leadership position. I don’t want to put across the position of Republican Sinn Fein that Adams was basically a stickie. But he was involved from 64, undoubtedly the Official trajectory has a very big impact on how Adams tried to move his own movement away from what is by the 80s fairly meaningless violence. BH: In one way, I take a different view of it. It takes Goulding an awful long time. He is in his 40s by the time he starts to talk about this. Sometimes people write socialism into the young Goulding, and in some ways he did this himself. During the Second World War, Goulding is in the kind of right wing camp in the Curragh and after the war he a very dedicated IRA man rebuilding the organisation for a confrontation with the British. A terrible thing about Irish Republicanism is that when people change their minds or when people change directions, its always put down to some kind of personal corruption or some kind of personal failing. In the late 1960s, it was said that people had been converted to Marxism by an East German spy in prison, Klaus Fuchs. They did know Fuchs in prison but it’s a couple of years before there is any sign of Marxism. And again, even to talk of Marxism, I think it’s a process through the 1960s, Goulding and others are grappling around, he was looking for ideas. You read histories of the IRA saying people left the IRA in 1963 because of the influence of Roy Johnston. Johnston wasn’t even involved at that stage. You read the United Irishman from that time; you see precious little sign of Marxism, and no evidence of demilitarisation. Again, it’s a long term process. Goulding is well into middle age by the time he’s turning the movement around in this direction. Within the leadership, even the people who support him, I would say Sean Garland from an early age is interested in Marxism. Some of the key people who supported Goulding, such as Thomas MacGiolla or Mick Ryan, I don’t think they would have described themselves as Marxists in the late 1960s. It’s inevitable that people will draw comparisons between Goulding and Adams, but he goes through quite a different process in some ways. SM: Adams is a product of the process as well. People are amazed that Adams went with the other camp. The two projects are very different. The Official viewpoint is born out of a Dublin working class view of where they want to go, while the Adams view is born out of a Belfast Working class view of where they want to go. The Dublin working class view is that they want to have a united working class. I don’t see Adams and co, other than laying the odd wreath, as attempting to develop a united working class. Provisionalism is still communal politics. There are continuities and differences between the two. RW: If we look at the influences on the IRA during the 1960s, how important was the changing international context? How important was, say, Cuba? Were international changes having a direct influence on people in the movement, or were the changes more due to failure of the border campaign and the repression that followed? BH: Well, it’s a mixture of both. The international context is important. The Cuban example is important during the border campaign itself. Initially, Cuba isn’t a socialist revolution. Militarists could feel affinity with this fairly small military group being able to overthrow the state. SM: They were following the Cuban Guerrillas as they were in Mountjoy. They had a map. People like Al Ryan in Waterford, who went with the Provisionals, were very into Cuba. 18 guys could land in a boat and liberate a country. It’s a very good example if you were a militarist. But the whole 60s context is important. Again, there are contradictions in it. Eventually they talk about Vietnam, eventually talking about apartheid in South Africa. Again, the national liberation struggles have a big influence on them. There is no exact model which they adapt, but they seek examples and encourage people to look at places where there are lessons for Ireland. But they are very influenced by the Republican Congress. They are the people who they name check. Goulding starts to say ‘we are going the way the Republican Congress was going.’ People like George Gilmore, a Republican Congress veteran, were influential in the background. The Connolly Association in Britain, which formed from the Republican Congress, was massively influential. In no way was this something which was imported in, it’s basically a rediscovery of the route that the Republicans were taking in the 1930s. RW:It’s often said that Republican history repeats itself. Is there a sense of the 1960s generation of Republicans repeating the Republican congress move of the 1930s, in the same way the Provisionals would embrace politics in a move like the 1960s generation decades later? SM: But there are divisions within the Republican Congress veterans. It’s not as if the Republican congress veterans collectively saw the Republicans of the 1960s as their offspring and thought ‘we are going to help them’. Peadar O’Donnell went out of his way, seemingly, to stop them getting involved in the “Save the West campaign”. He seemed to feel a bit like this had been tried before. But a guy like George Gilmore is in there, helping away. A guy like Mick O’Rirordan is there nurturing them. I have to say, in a sociological sense, there is the input of the age of people. Once people manage to get that adventurism out of them, why do they want to make these changes? You had guys joining saying that if they could get the North back, that could end immigration. Then you had a guy like Sean Garland realising when he was in prison that social change wasn’t going to come by just getting the North back and protestants weren’t going to suddenly realise they were better off in a united Ireland. The border campaign was for many of them their first experience of the North, their first experience of Northern Protestants. The 1960s generation read the work of Wolfe Tone and read the works of Jemmy Hope, who was a Presbyterian weaver who continued the struggle long after the United Irishmen. If you read some stuff by Dessie O’Hagan, it was as If Wolfe Tone was a communist in his mind. RW: What might be termed “the move towards politics” of 1960s Republicans is often portrayed as a product of outside influence-people like Roy Johnston, Anthony Coughlan and the Wolfe Tone society. Are you suggesting that the shift of politics was rediscovering a Republicanism that’s always been there? SM: Yes, and they go and seek outside influential intellectuals. Roy Johnston was recruited through the Wolfe Tone Society, which was set up by Cathal Goulding. Sean Garland is maybe the biggest reader among them. In the 60s, Garland was in Birmingham and he used to get booklets from the Communist Party bookshop and read them. So it could have been from his own reading. The socialism comes from sitting back and thinking really, what is the point of this and how do we achieve victory? And they look towards socialism for both of those reasons. BH: I think again that the cliche is that a couple of outside intellectuals are brought in and they begin this process of transformation that just doesn’t work. Still right up until 1969, it is so eclectic. A lot of people don’t agree with Johnston when he argues that they shouldn’t call for a workers Republic because it’s ultra left, it will put people who have property off. A lot of Republicans say ‘no, that’s exactly our slogan.’ It’s a cliche, but unfortunately it’s still put out there as an explanation as to why the movement changes. SM: One of the biggest cliches is that Roy Johnston is a Stalinist. Johnston is now a member of the Green Party, and I think the Greens are the home for Roy to some extent. But if you look at what he said, even though he eventually joined the Communist Party of Ireland, Johnson was anti-Stalinist. BH: In 1967, 68 and 69, things are in a flux. There are people in the movement who would have been influenced by Maoism, influenced by Moscow Communism; you have people who were Trotskyists people who would have called themselves Republican Socialists. You have all these ideas floating around, and very often the leadership disagreeing on things. People like Mac Stiofain and O’Bradaigh took positions that you would not neatly fit them into. In the late 1960s, the Republican movement wanted to form an alliance with the Communist Party and with the YSinn Feinoung Socialists and with others. SM: We can’t forget that MacStiofain and O’Bradaigh were involved in social agitation. They were also very much practising Catholics. Garland says he was never a practising Catholic, and it would have been hard to see Goulding as a Catholic, given his lifestyle. You are not sure what way people are going to go in that period. BH: One thing that MacStiofain and O’Bradaigh do share is a the belief in the purity of abstentionism, that you can not take seats in Leinster House or Stormont or anywhere else. And the Northern Republicans, surprisingly, are not like that, even some who went with the Provisionals. It’s important to remember that the changes in the 1960s were driven by the IRA. They wanted Sinn Fein to become a political force, but they had to force it to become one, it wasn’t going to happen without them. As early as 1965, they put forward that they will take seats if elected and they come up with ways to make sure people don’t sell out; a TD will have to do certain things. SM: And as one leading member said,”if they did do something wrong, they would be shot.” I think he’s still of that opinion. RW: How did the IRA and Sinn Fein approach the subjects of religion and co-operation with left wing organisations in the 1960s, given that a certain anti-clericalism and suspicion of other left wing groups would later prevail in the approach of the Officials? SM: The Republicans of the 1960s adapted a broad front approach, a fairly run of the mill Communist party broad front approach that Johnston approaches. They were looking at the Vietcong who adapted a broad front approach. Some of the suspicion of the left comes later, with the suspicion that they were more pro the Provos. Some of the suspicion of certain forces on the left comes early enough, because they are actually splits form the movement. In the 1960s, the Catholic priests, Sweetman and Flannery give the army council the use of their priory. There is a secularism in that they are following the united Irish men - Protestant, Catholic and Dissenter. But the actual anti-Catholicism is something that Garland has early on, or claims to have anyway, but that in some ways is a product of the split. The Catholic Church does basically back the Provos. If someone has to come out on top in the Republican split, for the Catholic Church and Fianna Fail, they would prefer the Provisionals to these commies. BH: A standout thing is that Johnson in 1966 writes a letter to the United Irishman asking that the rosary be abandoned at commemorations because if you are a secular movement, you shouldn’t have a prayer that excludes different religions. This is often mentioned in the histories. MacStiofain refuses to sell the paper and is suspended for a few months. But they don’t stop saying the rosary until after the split. And even then, outside of Dublin, the officials still say the rosary for a number of years. SM: Even now, there are official volunteers who get the Faith of Our Fathers played at their funerals. But to paint the Officials as very strongly anti-clerical is wrong. Even in the mid 80s, the influence of liberation theology was strong. BH: In 70 or 71, the Provisionals in Belfast released a statement talking about agents of Moscow and these people who try and delude young republicans, who wear the Lenin badge more than the pioneer pin of the Fainne. Actually, at this time Thomas MacGiolla was wearing both. RW: What were the factors driving the 1969 split in Sinn Fein, which created Provisional Sinn Fein? SM: Abstentionism. The North got dragged into it, but abstentionism was they key issue. The North got dragged into it and a large number of Northerners go with that split. It was a political split, somewhat about socialism but mainly about abstentionism. That split could have happened a lot earlier on. Seamas Costello was pushing to have them out in 66 when he became chief of Staff. He wants them out. Johnston thinks it better to have them out as well. Garland and Goulding do not want a split. MacGiolla does not want a split. BH: It is very likely that there would have been a split at some stage over abstentionism. It was a bit less likely to occur over socialism, as the socialism was more fluid. But the argument after August 1969 is that the politics of Dublin let down Belfast. Now that argument tends to come from people who came back, after leaving in the aftermath of the border campaign. They made the argument that if the Dubliners and the people in the South hadn’t been interested in politics and the question of socialism, there would have been more guns. One of the things we try and bring out is that the IRA was active in August 1969 and they did defend Catholic areas to the best of their ability. They were under equipped. They were taken by surprise. The Irish and British governments were taken by surprise. The other thing is that there’re always people saying they saw the troubles coming, actually no one saw it coming. You don’t find too many people at the time predicting it. Secondly, we just didn’t find evidence of this “IRA, I ran away”. SM: The ‘I Ran Away’ couldn’t actually happen. The slogan reappeared in the Scarland report. The slogan had been used in the 1950s as a B special taunt. BH: It would make much more sense for a Unionist to say it. SM: Or Tim Pat Coogan’s thing, “Irish Ran Away”. That is something a B special would say. Our book is a history of the Officials. And the Officials in Belfast are the Lower Falls and the markets. In Ardonye, different things are going on. Ardoyne is the birth place of the Provisionals. In Ardonye, there were about 7 people who looked at themselves as active Republicans when the Troubles broke out. BH: You have the coming together of people who were primarily concerned about abstentionism, some of them very worried about socialism, and again people dismiss this now. But communism was a very pervasive thing in Irish life. In the 1969 general election campaign, FF go up and down the country saying Labour will introduce communism. So it is a pervasive idea. The Catholics have been attacked, they come off the worse. The question arises “Could the IRA have done better?” The finger is pointed at people for not having done better. SM: There may have been a conspiracy on the other side. The B Special attacks don’t just happen out of the blue. The UVF, Gustry Spence said they were recruiting in 1966. So that is another hidden path in Irish history. The Irish government is talking about what to do about this communist IRA threat. There are probably similar discussions in Stormont. The UVF were told that there was going to be an attack on Newry in 1966. It was going to be a minor enough attack, but the IRA did want to attack a Territorial Army base in Newry and take their weapons. BH: The other thing that is important about 1969 is that you have this consensus view that the IRA have given up the gun. But we have these reports from march 1969 where the cabinet are being given a run down on the activities of the IRA, saying their activities are very serious, they are a growing threat, but we know that they are divided politically and we should encourage this division, and like the Republican Congress, there will be a split and the communist element will be discredited. That could be crudely thrown back at you to say the Fianna Fail created the Provos, that’s not what I’m saying. But I am saying the Irish government were worried about Republicans. SM: And just on the turn towards socialism, it’s done by practical things in that socialist governments support revolutions, socialist governments may arm the IRA. That’s one of the reasons why people in later times want to get close to Moscow, because there is a possibility of guns. If the guns had come from Russia, who knows what MacStiofain’s position would have been. RW: What is the relationship between Fianna Fail and the creation of the Provisionals? SM: That is a subject for another book, or for a programme that isn’t about how Lynch invaded the North. We can not give definite answers on that. All we know is that the Irish government was interested in giving weapons, did have a political impetus as to why it wanted to give those weapons, and it wasn’t all about Northern Ireland by any means, it was about Southern Ireland and the communist threat. And you have to remember people in the Irish government were by and large dedicated Irish Catholics, who had been brought up to believe that communism would line the priests and nuns up and shoot them. And these people took this threat seriously, at an existential level, the threat of international communism. BH: I would say again that I wouldn’t say that FF created the Provos. August 1969 would have created some form of organisation in Belfast and elsewhere and you have the defence committees that were set up. One of things that we show is that people who are loyal to the Dublin leadership got guns from Charlie Haughey, got guns from elements within FF. And again, the question is raised why guns went to certain individuals. I’m not sure if FF, even if they did have special branch advice, would have known who exactly was going to go where. BH: One of the big things for Haughey is that Haughey wants to ride to power on the back of this crisis, if he can be seen as defending the nationalist people in the North. He doesn’t have the credibility within FF. His father was a captain in the Free State army. He isn’t known as Republican agitator. In 1962, he is credited with crushing the border campaign, so this is massive opportunity for him. Blaney may have been more emotionally involved, but again Blaney regards Derry as part of his patch and he wants to get in there. Boland feels the moment has come to reunite the country. So you have all those elements. You have this massive confusion. I think Lynch knew but he didn’t want to know. Captain Kelly, who I think was acting for the government, not just Blaney and Haughey, says in an interview a few years ago “Who wants to give guns to someone who wants to overthrow you, it’s just not on”. It became sensible to say look these people are still talking about overthrowing the state, let’s give them to people who are only interested in fighting up there. SM: The last thing they wanted was an empowered, united IRA in the North. Malachy MacGurran, one of the most senior IRA figures in the North, in 67, is talking about wanting to take power in the South first. Maybe the toppling of the Irish government is the first thing. Why logically would they want to empower people to do this? RW: The book describes how Goulding and Garland made an approach to CPI general secretary Mick O’Riordan in 1969.Would things have been different if the efforts to secure guns from the USSR, through The CPI and Mick O’Riordan, had been successful? Is that a serious bid? SM: I’m not into counter factual history. We just don’t know. It was a serious bid. Guns eventually come through this channel, but it takes many years. If the KGB or the Soviets had succeeded in arming them, the British and Irish governments would have united to deal with this threat. Because that was the last thing they wanted, a soviet backed force; I think the US would have involved themselves as well. That was the last thing they wanted, a force of armed men backed by the Soviets. That was the ultimate nightmare scenario for them. BH: There needs to be more written about this. Whoever gets the guns first was going to win a lot of people to their side. One of the reasons why the whole argument about FF and the Provisionals in 1969 became discredited was the Workers Party overused it. Their line was that FF created the Provos to get rid of us. They just overused it, and eventually people stopped believing it. People can begin to say “why did they want to get rid of you? You didn’t have one elected representative”. So I think there is a whole range of elements involved there, and nullifying the left is one of them. In the mood of August 1969, there were people in FF that didn’t care, juts head for the border, do whatever. It’s an element in the split certainly. An overuse of a very crude version of it has meant that it has become discredited and needs to be examined a bit more dispassionately. RW: The next thing that I want to talk about is the very clear role of the IRA in founding the Northern Ireland Civil Rights movement. BH: They were key to the founding of the Northern Ireland Civil Rights Association. There were various bodies - the Catholics for social justice etc, but because it was used by the Unionists most people don’t want to hear it, but the fact is that the commander of the IRA in Belfast Billy McMillen was on the executive of NICRA, the first executive, and they are present right throughout its existence. Republicans are on the NICRA executive and Republicans are important, particularly at a local level and across a lot of rural Ulster. If you look at the speakers on platforms, a lot of speakers would have been local IRA OC. SM: Billy McMillen is not there by default. Billy is later taken away from the executive because the IRA doesn’t want to show their hand. They have a strategy of using people as front people, but they have a defining influence. They are the first people to call for marches. The Unionist idea of a communist/republican conspiracy at the heart of the civil rights movement isn’t totally wrong, in my opinion. BH: Another aspect of it is that a lot of the people who write about it, particularly those involved in it, say from Peoples Democracy, say that this was part of the reformist republican agenda, this idea of not upsetting the apple cart and having very peaceful marches. When you actually look at the strategy, in Derry, they deliberately provoke the police in order to up the ante. They themselves are divided. Retrospectively, people often believe it’s all peace and love from civil rights platforms. But if you look at the actual speeches, very often people are saying “the aim of this movement is to get the British out”. SM: That is the aim. These marches are supposed to be all about the people rising up. But the Belfast Brigade of the IRA is being bussed to Derry, to Newry, they are on the move, they are like a flying picket. RW: Were you conscious that you were somewhat rewriting what might be termed as the official history of the Northern Ireland Civil Rights movement. SM: Yes, because these people have never talked about this before. They were doing these things under orders as part of an armed organisation. This was a strategy. BH: It’s a rewrite of the Workers Party view of the history of the civil rights movement also. In the 1980s, they would have stressed that there was this movement that sought to unite Protestants and Catholics. But if you look at what Republicans said at the time, they saw it as a way of ending partition - to demoralise unionism, to split and divide unionism. There is one IRA volunteer from the time who said to me “If you said we were trying to democratise Northern Ireland, we would have laughed at you”. It was their duty to overthrow it. There is a great picture of Joe McCann with a placard saying “Civil Rights for everyone”. This was a member of the IRA whose job it was to overthrow the state and he sees no contradiction in holding a fairly bland civil rights placard. SM: The IRA are directing the Civil Rights marches. The reality is that the spark for the IRA’s adoption of the civil rights strategy comes from the Connolly Association, comes from Desmond Greaves, who is an avowed Moscow Communist who welcomes the tanks into Prague. His closet representative here in Ireland is Anthony Coughlan who formulates this and it is adopted by the Republican movement. BH: One of the complicated factors is that Greaves and Coughlan have a very set out strategy of how you would do this and not provoke the unionist establishment. The IRA buys into the tactic of civil rights to divide unionism. SM: All of these things are being replayed after 30 years of sectarian, communal violence. In documents used in Republican education, the IRA are stating that the UVF is a good development. This is working class Protestants thinking for themselves. They need to be won over to the cause. All the time, the official Republicans are thinking ‘we need to get a united working class approach to this’. And Johnston has it in a document saying “We should not condemn Paisley because his is an expression of non-Tory, working class unionism”. You have to remember that is prior to sectarian conflict and they are constantly thinking ‘How do we get working class Protestants involved’. The painting of the civil rights movement as a nice, cheery little thing is very far out. Lets look at the official IRA republican movement in the years prior to the ceasefire in 1972. One of the major events is the battle of the falls in 1970. Later that is left behind by the Official Republican movement and now is being commemorated by the Provisionals. BH: At the time, the united Irishman talks about it as being the biggest single engagement between the crown forces and the IRA since 1916; they do really trumpet it as a big moment. By the late 1970s, and certainly by the 1980s, what became the Workers Party utterly downplays and in some cases writes out completely any military activity by the Official IRA. This does allow others to come in and claim it. In the anniversary in 2005, Sinn Fein was able to organise the commemorations and not mention the Officials. There wasn’t much fear they would be contradicted, though the Official Republican Movement got some stuff about it out. There was hundreds on the streets fighting the British army, and the Officials were the main organised group doing the fighting. It’s the first major confrontation between the IRA and the British army in the conflict. It’s part of a forgotten history that allows others to claim the history. SM: Looking at the documents, the British do want to break the regular IRA at this stage. They see the regular IRA as a serious threat and they want to go in there and break it. People associated with the Official movement told me back in 2005 that all those guys who did the defending either went with the INLA or the Provisionals eventually. The vast majority of that unit stayed official all the way. That’s D company in the lower Falls and they are one of the most loyal units to the leadership. Official all the way. BH: The Officials never officially declare a campaign; this is the strange thing about it. They always say from the start that the military campaign isn’t going to dislodge the British, that there will be a need for an armed campaign, they say in speeches “armed Irish men will meet the forces of the British in the 1970s”, but they never say that military victory alone is possible. They put a lot of energy in the early 1970s on mass activity, in getting people on the streets, in holding pickets, organising boycotts. This becomes difficult to do as things get worse. But a difference between them and the Provos is that the Provos do believe they can force the British out. In 1972, they say that will be the year of victory. While the officials say no, you are never going to win a military victory, you have to use violence selectively, defence and retaliation. The theory is that you can have a very selective military campaign, retaliate for certain activities, and defend your areas. In reality, by 1972, as one army council member was saying, there was so much retaliation to do, there was so much defence to do, we were in an unplanned army campaign. SM: Squaddies are on the streets of Belfast. I think there is an instinct to retaliate. The British army are killing innocent civilians, they are killing innocent kids. The problem that the Officials have is that the Provisionals have a political strategy which means they have to reign in their gunmen, while allowing them to do a certain amount of stuff. But they have this overriding view, ‘how do we get the protestant working class on board’, which goes back to the united Irishmen. If you look at the border campaign as a re-enactment of the 1920s War of Independence, these people were trying to re-enact the 1790s, and get a united Catholic and Protestant force to take on the British. The last thing they want to do is push people into loyalist positions and they are constantly aware of this. And this is why they eventually call a ceasefire. It’s not because they shoot Ranger Best, not because of Aldershot, it’s because they see the UDA becoming a mass movement. They look upon UDA members, not as the enemy, but thinking, ‘we want these guys in their mass movement’. That is the biggest overwhelming thing why they want to end this campaign. Belfast isn’t happy about it. But there is more support for the ceasefire in Belfast than there is in Derry where there is a cleaner fight between them and the crown forces. In Dublin, they are saying, we are going to have to either wipe out the Provos, so we can have things back under control. Or if we don’t wipe out the Provos. We are going to have to withdraw from fighting. Wiping out the Provos by 1972 is an impossibility for the Officials. They are smaller; they would have been wiped out. The ceasefire becomes the only thing they could do to follow Official political strategy. BH: There are no fully worked out plans. They have a theory that they want to unite the Protestant and Catholic working class, but at the same time they defend nationalist areas against loyalist. A lot of young people joining the Officials because they are the main group in the area, and they would have all sorts of ideas. There are certain areas that they feel they would have to be very active to ensure that the Provisionals didn’t get everybody. Then the teenagers have exactly the same instincts as every other nationalist teenager. As one person, said, after internment, everyone just said, get into them, get into the Brits, these people won’t do that it in our areas. There is no great strategy to it. RW: What are the factors behind the INLA/IRSP split in 1976? SM: By the time of the split, 2 distinct positions emerged. We have a document that was sent to the UVF in the 1974 period, they were making clear that guns would have to be used again but it will be for working class demands. The Workers party has retold a history where they were a political, campaigning group. This is a revolutionary armed group, except, one group wants to fight a class war. The other group wants to fight a class war, but believes that you will never be able to win the protestant working class because they have benefits within the Northern state. That position solidifies around Seamas Costello and people from Derry who are fighting a clean war. The other position solidifies around Cathal Goulding and Tomas MacGiolla. Sean Garland comes back from living in Glasgow, he is initially supportive of the latter position. He believes the Provo split is a disaster. He wants to try and keep as many people together as possible. After the ceasefire, the political argument comes to a head. You have Seamas Costello putting forward the revolutionary position, and Sean Garland putting forward the revolutionary position. When the split occurs, it’s more wounding. When the INLA split, these are people you have done time with, that you have alongside with against the British and the Loyalists, and this is really a gut wrenching split from them. This is the boy General, Seamas Costello who some of these people look upon a younger brother figure, they are beginning to realise that Seamas is going one way and they are going another. As we know in splits, this usually ends in bloodshed. This is a very confusing period for them. This is why you have 2 army conventions in 1972. Things are ripping apart again and it’s all tied in with the northern struggle. There is very little disagreement on what should be going on in the south. But the Northern struggle and the ceasefire makes for another horrific split, that makes them lose Billy McMillen and Seamas Costello. BH: One of the very important things that we got was the minutes of the 2 army convention meetings from October and December 1972. There you see, clearly, the 2 positions being put forward. What Garland is worried about is what happens if you leave behind Republicanism, that you leave the ground open to the Provos. At the time he is saying, the Provos are going to be around for a long time unless we monopolise the republican struggle. He talks of the dangers of adopting a 2 nations approach an about how the national question is key. The ceasefire is a conditional ceasefire. In fact, the Officials probably do more in certain areas and they are allowed to do it under the terms of the ceasefire. But he is quite interested in the ideas being put forward by a guy called Gerry Foley, an American guy and a member of the Socialist Workers Party. SM: Some people later believe he is a member of the CIA. That’s how much the Workers Party rewrites history. SM: What Garland is pushing at the time is education and building the revolutionary party, creating this cadre of people that will be at the vanguard of the revolutionary party. He goes to Moscow in 1973. He had already formed ideas of the Trotskyist nature about the revolutionary party. Finally, Garland, Des O’Hagan, and Thomas MacGiolla get certain guarantees from the soviet government about why they are willing to support the government. That’s when Garland decides he is going to go with the more Soviet approach. I don’t think he believes everything is beautiful in the Soviet world, it’s because he believes they have the resources to help his revolutionary party win power in Ireland.